"Dr. Sheinkman utilizes intraoral camera technology that helps enhance your understanding of your diagnosis. 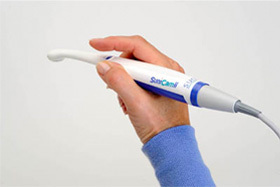 An intraoral camera is a very small camera – in some cases, just a few millimeters long. An intraoral camera allows our practice to view clear, precise images of your mouth, teeth and gums, in order for us to accurately make a diagnosis. With clear, defined, enlarged images, you see details that may be missed by standard mirror examinations. This can mean faster diagnosis with less chair-time for you! Intra oral cameras also enable our practice to save your images in our office computer to provide a permanent record of treatments. These images can be printed for you, other specialists, and your lab or insurance companies". With its crystal clear images and contoured shape, SuniCam II is the perfect diagnosis partner for early clinical detection and patient education. Its ergonomic design, ideal size and light weight make SuniCam II a comfortable fit for both clinician and patient, and it’s easily portable between operatories. 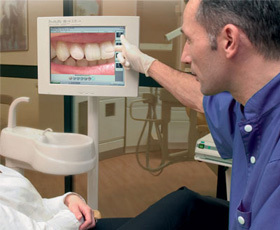 SuniCam II allows you to document and show outer areas of the teeth and gums-including lesions, cracks, and calculus buildup to your patients on a computer screen. With it’s curved design, light weight and compact head (with LED lighting), SuniCam II feels good in your hand and maximizes patient comfort. SuniCam II easily integrates with with Prof. Suni or Dr. Suni software, and like all Suni imaging products, is compatible will all major practice management software. SuniCam II’s 105° angle of view separates it from most other cameras that only give a 90° angle. This increased angle allows for better exploration of posterior areas and ensures you the most thorough diagnosis.